Last week, representatives of over 20 organizations gathered in Seattle and Bellingham for several days of dialogue, action, and celebration of the growing food sovereignty movement. The Encounter, co-hosted by Community Alliance for Global Justice and Community to Community Development was a national gathering of the US Food Sovereignty Alliance (USFSA). On Saturday, we honored Alliance for Food Sovereignty in Africa and Farmworkers Association of Florida as recipients of the 8th Annual Food Sovereignty Prize, awarded by the USFSA. 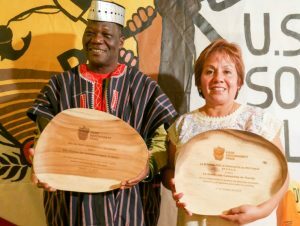 This entry was posted in Blog and tagged Agroecology, Fair Wages, Farmworkers, Food Justice, Food Sovereignty, Food Sovereignty Prize, Genetic Engineering, GMO, Local Food, USFSA. Bookmark the permalink. ← NFFC’s Fall 2016 Newsletter Has Arrived!